Inflatable & Deflatable Trexler Rubber Company Tires and Wheels. Look great on SAM and vintage models. ANY MODEL AIRPLANE is definitely improved with Trexler Pneumatic Balloon Wheels. Trexler Wheels, made of the finest grade of latex rubber, offer the utmost in toughness and long life for your RUBBER or GAS powered model. The patented inflating tube and valve permits Trexler Wheels to be inflated and deflated at will. No extra valve to bother with. No separate pieces to lose. Trexler Wheels may be inflated by the breath, or with the handy accessory pump. The wooden hubs supplied with Trexler Wheels are separate from the tires. The tires may be mounted or demount-ed at will. The hubs are left plain - to be decorated to match the plane, or finished in any desired color. This is a convenient hand pump for inflating Trexler Balloon Wheels. It is especially useful for inflating the heavy type wheels for gas models. Simply insert end into tube on tire, inflate tire to proper diameter. Then twist tube to seal and wind it around the wheel hub and tuck it in. 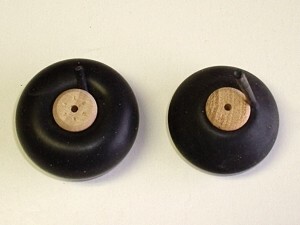 Trexler Balloon Wheels Pair Model #1. Measures .020" Nominal Wall Thickness x 1-3/8" Nominal Inflated Diameter, with Hubs. Also available in thicker "Heavy" version, Part #TRX01H. Made of the finest grade of latex rubber, offering the utmost in toughness and long life for your rubber or electric powered models (Gas powered versions are also available, part numbers include the letter "G"). Trexler wheels willl complete your vintage, scale, or any model with classy authentic style. Inflatable & Deflatable! The patented inflating tube and valve permits Trexler Wheels to be inflated and deflated at will. No extra valve to bother with. No separate pieces to lose. Trexler Wheels may be inflated by the breath, or with the handy accessory pump. Demountable, too! The wooden hubs supplied with Trexler Wheels are separate from the tires. The tires may be mounted or demounted at will. The hubs are left plain - to be decorated to match the plane, or finished in any desired color. Tires are boxed and include inflation insert. Trexler Pneumatic Tires have been enhancing models since 1936, and we're excited to add them to our line! Order yours today, and don't forget the Hand Pump, too! This is Item #TRX01, see listings below for other sizes and types available. .020" thick nominal wall thickness x 1 3/8" nominal inflated diameter with wooden hub/wheel. Natural latex tire. Instructions included. Weight = 0.15 oz/pair. Carrying Capacity = 6 oz/pair. .020" thick nominal wall thickness x 1-5/8" nominal inflated diameter with wooden hub/wheel. .040" thick nominal wall thickness x 1 5/8" nominal inflated diameter with wooden hub/wheel. While supplies last, discontinued by Trexler, sorry! .020" thick nominal wall thickness x 1-7/8" nominal inflated diameter with wooden hub/wheel. Weight = 0.30 oz/pair. Carrying Capacity = 8 oz/pair. .020" thick nominal wall thickness x 2-1/8" nominal inflated diameter with wooden hub/wheel. Leftover new wheel spool (NO TIRE) from broke up set. One wheel only. .020" thick nominal wall thickness x 2-3/8" nominal inflated diameter with wooden hub/wheel. Weight = 0.35 oz/pair. Carrying Capacity = 10 oz/pair. .020" thick nominal wall thickness x 2-5/8" nominal inflated diameter with wooden hub/wheel. .050" thick nominal wall thickness x 2-3/4" nominal inflated diameter with wooden hub/wheel. Weight = 1.0 oz/pair. Carrying Capacity = 6-8 lb/pair. .050" thick nominal wall thickness x 3" nominal inflated diameter with wooden hub/wheel. Weight = 1.5 oz/pair. Carrying Capacity = 8-10 lb/pair. .060" thick nominal wall thickness x 3-1/2" nominal inflated diameter with wooden hub/wheel. Weight = 2.0 oz/pair. Carrying Capacity = 10-12 lb/pair. .060" thick nominal wall thickness x 4-1/2" nominal inflated diameter with wooden hub/wheel. Weight = 3.0 oz/pair. Carrying Capacity = 12-15 lb/pair.